I love breakfast- but hate breakfast leftovers. Eggs turn rubbery and it's always hard to eat left overs when they're never as good as fresh. Since my sweet husband and I have very different tastes when it comes to breakfast I decided to no longer make too much and waste it, but come up with a favorite of mine for just ME! One serving for ME! Order up! Take a look at this! Quick and DELISH! In a small skillet brown your hash browns in your olive oil on medium high heat. Add the ranch seasoning. In a small bowl whisk your egg and milk together. When your hash browns are cooked, add your egg and milk mix into the skillet and use a spatula to turn your eggs and hash browns together. (By using a spatula and turning them "over" like a pancake it makes the eggs fluffier) When eggs are almost done, add your diced ham bits to the skillet to heat through. Place onto your tortilla and garnish with sour cream and salsa! DELISH! *I always buy a small ham and cube it, then put in small baggies in the freezer. I can pull it out for company or use a little for my breakfast burritos! It works GREAT! This is a favorite recipe of ours. I haven't tried it with the Ranch Seasoning. It must be good. I like to add jalapenos, red peppers and mushrooms. They are always different (depending on whats in the fridge but always delish. Yum, this looks fabulous! 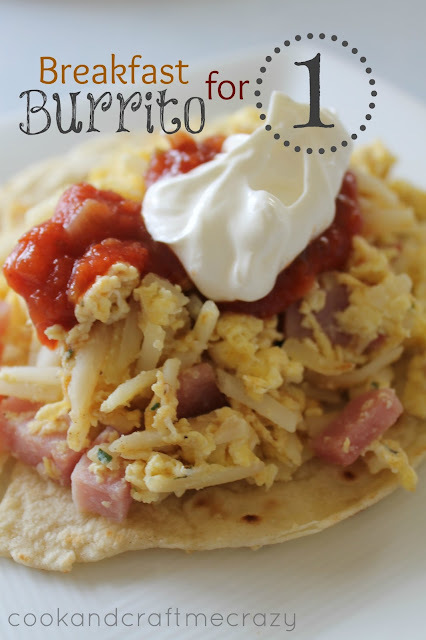 And great that it's only for 1 because my kids never seem to eat breakfast burritos! Found you through Tasteful Tuesday! Love hashbrowns in my breakfast burritos! Thanks for sharing at Sweet & Savory Saturdays!